I’ve always loved fall – I mean what’s not to love about comfort food, brisk clean air and colorful fall leaves! And it doesn’t hurt that my favorite holidays are all close at hand now too! Thanksgiving and of course Halloween! I will say since being on the Halloween Baking championship on Food Network last year Halloween has become even more fun! So today I’m sharing another Halloween Party food that I made for my Watch Party last year AND the Creative Foodies all have some party foods for you as well (scroll to the bottom). 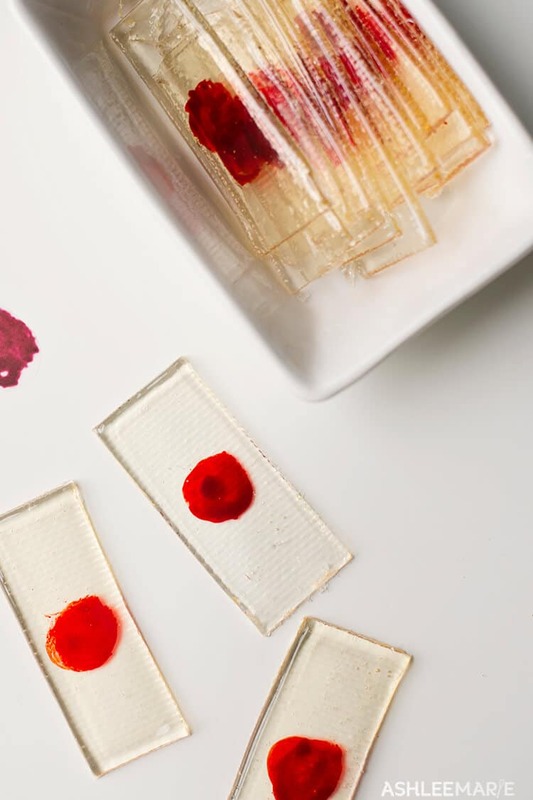 So… blood – it’s the easiest way to halloween up ANY food! 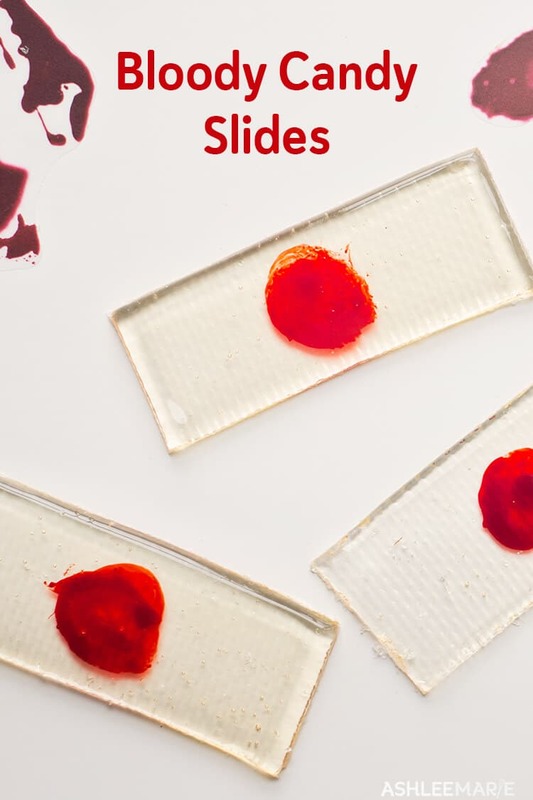 These are just suckers that instead of being on sticks I cut to the size of slides and added some red candy coloring to to create the “blood”. SUPER easy too! The Silpat mat left small impressions on the slides – so if you want yours to be perfectly flat you’ll want to stick with just using wax paper or parchment paper, personally I kinda like the texture. 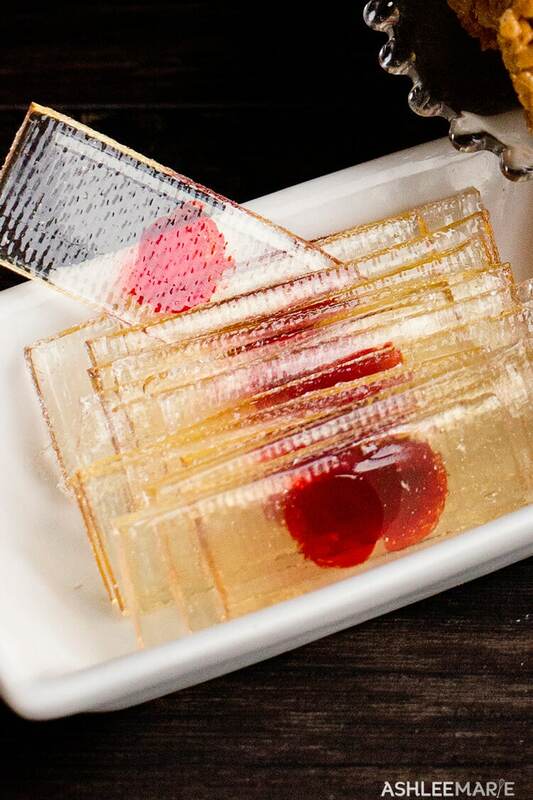 IF you want it to be perfectly clear – without the yellowing you see here that comes from the heat, then using isomalt and distilled water is a better option (and would be sugar free too). AND I have an ecookbook for you filled with more fun Halloween treats! 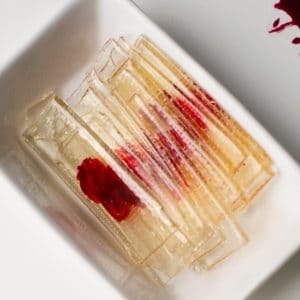 Just a small ecookbook with 18 fun treats including 3 edible “blood” recipes – berry coulis, caramel and buttermilk syrup. Perfect for a Spooky Halloween Party or afterschool treats! So check out everyone’s party foods! and don’t forget to check out more of MY Halloween goodies as well!